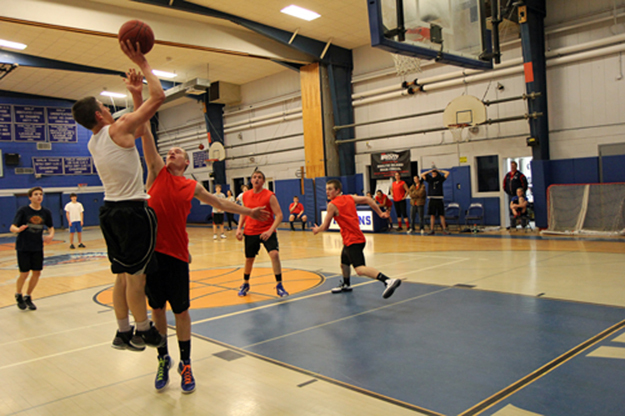 BEVERLEA WALZ PHOTO | Myles Clark with the jumper, defended by Riley Willumsen and orange shirt teammates Hunter Starzee, left, and Matthew BeltCappellino. March Madness has come to the Island! No, we’re not talking about Stony Brook, Hofstra or Long Island University. The students and faculty of Southold, Mattituck, Greenport, and Shelter Island participated in a student council sponsored event to raise money for charity. Each school held their own 3 on 3 event on Wednesday, March 13. The winners from each event met at Greenport High School on March 15 to decide the victor of the remaining final four. Last Friday evening’s event brought in over 200 fans, a great success for the first year of the event. Student council members were super excited to prepare and plan for next year’s event, which we hope will be even bigger. Shelter Island was represented by students Matt Dunning, Margaret Michalak, Mathew BeltCappellino, Spencer Gibbs, and” Moiles” Clark. The faculty was led by Peter Miedema, and supported by Dr. Dibble, Rick Osmer, and Hope Kanarvogel. Both teams were competitive and look forward to winning the event next year. The money raised by Shelter Island Student Council will donated to the scholarship fund for a deserving senior this year.